After the misfortune of not being able to attend the Madison Violet show earlier in the year at this venue, due to the rare intervention of wintry inclement weather this past winter, there was no such hindrance when the current Good Lovelies UK tour arrived at the small Herefordshire market town of Ross-on-Wye. This unique church setting added to the growing list of unconventional venues prepared to host roots artists and provided the perfect backdrop for this Canadian trio to showcase their brand of folk music. 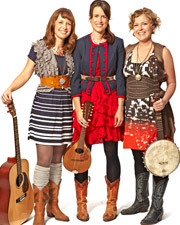 The group comprising of Kerri Ough, Caroline Brooks and Sue Passmore, formed in Toronto around half a dozen years ago, are currently riding the crest of a resurgence of old time traditional music given a new lease of life by a younger generation and increasingly embraced by UK audiences. These audiences are being spoilt by the number of quality artists being prepared to cross the Atlantic with Canada comparing very favourably with their more populous southern neighbours. The hard working Good Lovelies now have four releases behind them including the 2007 debut EP ‘Oh My’ and a 2009 festive album but it is their two full length compilations of self penned songs that comprise the bulk of their live performances, which can number around 150 a year. Both albums have received critical praise in their homeland with prestigious Juno nominations/awards and in particular, it is the current release, ‘Let the Rain Fall’, which forms the centrepiece of their 2012 UK gigs. A Good Lovelies show is not just a very comprehensive package of a couple of forty five minute sets, it is a story telling journey about their lives, loves and experiences of travelling both around the vastness of their home country and the early adventures of being fortunate to take their talents overseas. After opening the evening with the catchy number ‘Kiss Me in the Kitchen’, the girls went on to perform another six tracks from the current album in the first set including two songs with a heavily Canadian influence , ‘Old Highway’ and ‘Backyard’, the latter written against the backdrop of much derision of their home town by fellow Canadians. The alternative subject of personal relationships was also explored in the mellow song ‘Best I Know’. The group are also keen to celebrate the work of other selected artists in their set and paid tribute to fellow Canadian band The Deep Dark Woods with a cover of ‘Winter Hours’ before closing the first half with an acapella off-mic version of Gram Parsons’ ‘Juanita’. You could sense the girls were really ready to ditch the microphones and test the church acoustics with their beautiful harmonies and the appreciative audience were clearly in full agreement with this. For the second set, the band delved a little into their back catalogue by selecting three tracks from their 2009 self titled release, the stand out song being ‘Lie Down’ , a number performed towards the end of the evening with its easily remembered chorus collaborated with prompted audience participation. This second part of the evening also included some personal favourites from the new album, ‘Free’ which needed no introduction from the band and ‘Mrs T’ with its enchanting French interludes. The girls were also keen to come off-mic again and their exquisite harmonies delighted those present with an unaccompanied version of the Boswell Sisters’ ‘Heebie Jeebies’, a song preceded by a wonderful tale of it being sung at a US/Canadian border crossing. The audience were given one final rendition of this style of delivery with their encore version of Leonard Cohen’s ‘Hallelujah’. Although an acknowledged predictable choice, this performance, assisted only by Caroline’s unplugged guitar and the arrangement of each girl taking the lead on particular verses, worked well and rounded off a perfect evening of musical entertainment. The strength of a Good Lovelies show is their sanguine disposition, confident banter, infectious harmonies and uncomplicated sound, though the girls showed their diverse string instrumental skills as well by effortlessly switching between bass, banjo, acoustic guitar and mandolin. It is hoped the band return to our shores soon and perhaps the biggest complement is that they made the time and money invested in a 120 mile round trip extremely worthwhile.